The Alaska SeaLife Center is Alaska’s only public aquarium. Experience, explore, and discover the unique marine world of puffins, harbor seals, Steller sea lions, giant Pacific octopus and more! Alaska’s coastline extends over 6,640 miles—more than all of the US Coastal states combined! Don’t miss your opportunity to experience the diversity of life in these northern waters. Make it a day trip when visiting Anchorage – your AABBA host will guide you with details on transportation options and the route if you are driving! Go nose-to-nose with playful harbor seals and Steller sea lions in our Underwater Viewing area. Get a hug from a sea urchin as you meet the unique creatures that inhabit the Discovery Touch Tank. Did you know Alaska has rhinos? Rhinoceros auklets, that is! Get up-close to these winged rhinos, plus horned and tufted puffins, oyster catchers, murres and more in our Aviary. Watch them dive for fish in North America’s deepest diving bird tank! Our knowledgeable and friendly staff are always on-hand to share information and answer questions. Keeper chats and presentations scheduled daily. Go behind the tanks and into our “offices” with a guided tour or animal encounter. Walk through our animal care and research areas while learning about breeding programs and outreach efforts on a Behind-the-Scenes Tour. Join our animal care team during a training session on a Puffin or Mammal Encounter. 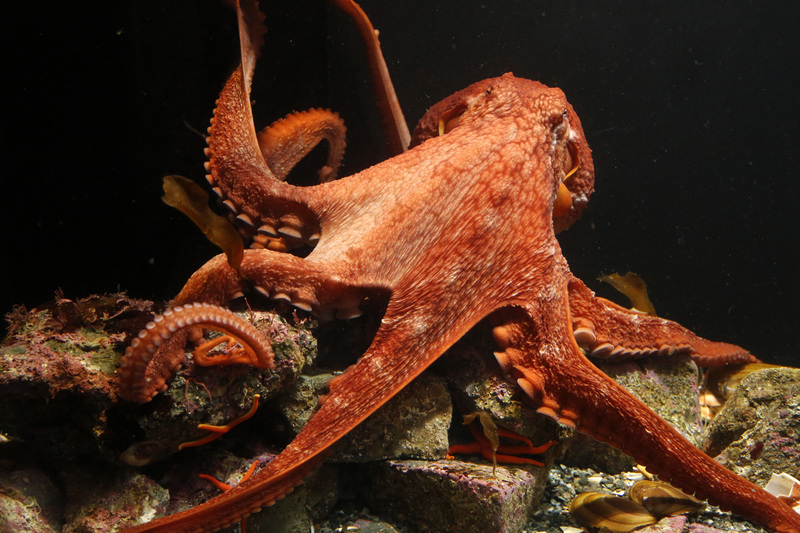 Shake “hands” with an eight-armed invertebrate on an Octopus Encounter. Tours and encounters offered daily. This entry was posted in Attractions, Day Trips from Anchorage, Things to Do, Uncategorized by admin. Bookmark the permalink.